A Year of Healthy Living 2012 Wall Calendar by Ann Lovejoy is a warm, heartfelt invitation to expand your awareness, improve your meal choices and enjoy life more every day. Each month features topics that approach food as a nurturing component of life that supports and sustains you. Artful fruit and vegetable photographs are paired with nutritious recipes and helpful tips, while weekly affirmations encourage steady progress at your own pace and invite you to rejoice in the simple joys that surround us all. 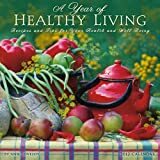 A Year of Healthy Living is about wanting the very best for ourselves and choosing health and well-being. Lovejoy is the author of more than twenty gardening books and two cookbooks, and is a regular cooking and gardening columnist for the Seattle Post-Intelligencer. She is also the author of The Essential Rose and The Organic Kitchen Garden wall calendars. The interior pages of this calendar are printed on 100% recycled, 50% post-consumer paper, processed chlorine free and printed with soy based inks. In addition to printing our products on recycled paper, Amber Lotus Publishing continues to plant trees and offset our carbon footprint with NativeEnergy. Charge your Micro USB or Mini USB device from this convenient wall charger with two USB ports. Unique tip solution allows you to charge all your devices from one power source (A32, A97 included, other device tips sold sperately). With it’s sleek small, sleek design and foldable blades it’s perfect for travel or home use and in style.